One autumn day, the gallery received a call from a New York City prop stylist with an urgent request for a globe for a photo shoot the next day. Former president Bill Clinton would be photographed for the cover of Time Magazine at his offices on the Upper West Side. George quickly took pictures of our gallery director, Jeffrey Denke, holding different globes to facilitate finding just the right one to fit the bill, so to speak! 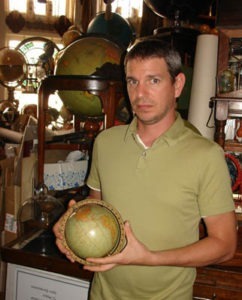 He emailed them to the prop stylist, Rob Strauss, who came by that night at 8 p.m. and rented two globes. 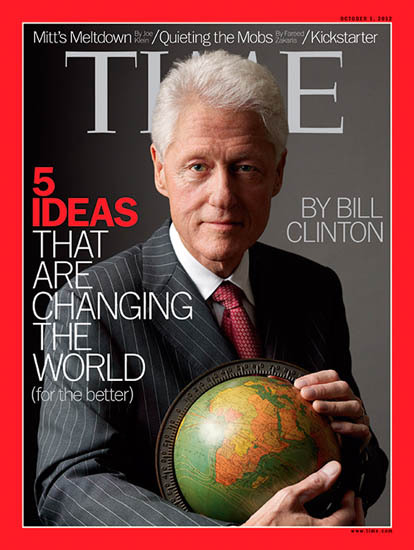 Two weeks later the photograph by Mark Seliger of Clinton holding our Kittinger 8-inch table globe hit the newsstands. Read more about the renowned photographer, Mark Seliger, and the back story about his photographing Clinton, on Time LightBox, the blog of the photo editors of Time. 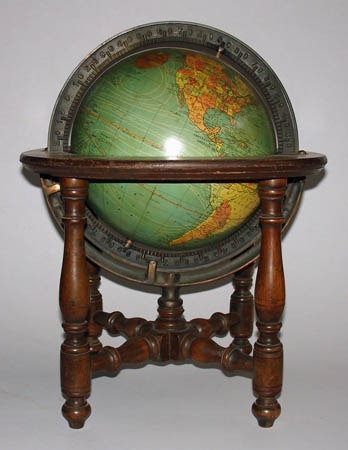 The Kittinger 8-inch table globe used in the shoot is from around 1927-30. To assist the stylist in choosing a globe we sent a few photos of how they’d look handheld off the stand.